Fact – China is the world’s largest user of copper. Copper is critical for China and the country has imported unbelievable tonnages over the years, but according to the copper bears the story could be coming to an end. According to the Beijing Antaike Information Development Co. copper consumption is expected to expand this year at the slowest rate since 1997. *In September, the ICSG projected that global refined copper demand in 2011 would exceed refined copper production by about 200,000 tons, continuing the production deficit experienced in 2010. The World Bureau of Metal Statistics said that from January to June 2012 worldwide copper demand surpassed production by 129,000 tons. Also, according to ICSG Copper Market Forecast 2012-2013, in 2012, world refined copper production is projected to increase by only about 2.5% to reach 20.15 million metric tonnes (mmt). Global Industry Analysts Inc. forecasts that the global market for copper is projected to reach 27.5 mmt by the year 2017. The world will need 7.35 million metric tonnes or 1.47 million metric tonnes of new copper production per year for the next five years to meet anticipated demand. How much copper is that? 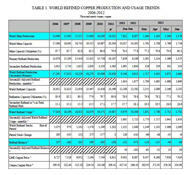 Thanks to about.com let’s look at copper production figures for 2010 from the world’s top copper miners. Codelco – the Corporación Nacional del Cobre de Chile – controls about 20 percent of the world's reserves of copper. In 2010, Codelco produced approximately 1.76 million metric tons of refined copper, about 11% of total world copper production. Freeport-McMoRan Copper & Gold Inc. (FCX) is the world's largest publicly traded copper producer. The company's assets include Grasberg, the world’s largest copper and gold mine in terms of recoverable reserves. FCX produced 1.44 million metric tons (mt) of refined copper in 2010, equal to 9% of the world total. Xstrata Plc’s copper production in 2010 was over 900,000 metric tons, Rio Tinto produced approximately 700,000 t of copper, Anglo American 645,000 t, Groupo Mexico 645,000 t, Glencore 542,000 t, Southern Copper 542,000 t and KGHM Polska Miedz at 425,000 t.
FCX is the world’s largest publicly traded copper producer – 1.44 million metric tonnes of copper per year, the worlds going to need 1.47 million metric tonnes of new copper production per year, is another Freeport out there? Perhaps another Glencore, Southern Copper and KGHM will be built each year? According to Beijing Antaike, the state run nonferrous metals consultancy, Chinese copper consumption was up 7.8 percent in 2011 to 7.33 mt, is expected to grow 5.9 percent to 7.76 mt in 2012 and to reach 10 mt per year by 2020. Currently there is an estimated two million metric tons of copper in China’s warehouses. Let’s consider Chinese copper inventories from another perspective – 2011’s 7.33 mt of copper usage works out to 20,082 tonnes a day, so two million tonnes of copper is 99 days of inventory – just three months worth of copper, two million tonnes for a country that, even if copper usage does not grow another tonne, will use 36.65 mt over the next five years, remember no one is forecasting Chinese copper consumption to stop growing, just slowing to between 2-4 percent growth. At the end of August, copper stocks held at the major metal exchanges (LME, COMEX, SHFE) totaled 434,277 t.
“A market can appear to be in a deficit and a surplus simultaneously because economic forecasts only look at production and demand for the calendar year and exclude excess stocks carried over from the past. The current oversupply – high inventory levels – are a consequence of the economic conditions of the last three years, current and future supply deficits will be strong enough to digest that oversupply. The impact of a build-up of inventory due to Chinese rail delays – there was a build-up of goods in transit due to transport delays on Chinese railways – sales of copper cathode were slowed. The outgoing Chinese government bosses, while waiting for a leadership change set for November 2012, are trying to prevent expansion from slipping below the 7.5 percent target set in March of this year. China's powerful economic planning body, The National Development and Reform Commission (NDRC), announced approvals for 60 infrastructure projects worth more than $150 billion. The new Chinese leaders are expected to introduce more policies to support the economy. "Losses in base metal prices will be capped despite weak fundamentals and global economic worries, as investors expect Beijing to do the necessary fine-tuning to stabilise the economy before the 18th Communist Party Congress." CIFCO Futures analyst Zhou Jie, referring to China's leadership transition event scheduled on Nov. 8. The second factor is the growth in wealth in the major developing countries – China, India, Africa and Indonesia have enormous numbers of people who are already middle class and hundreds of millions still to become middle class. According to the UN report “RESILIENT PEOPLE RESILIENT PLANET A Future Worth Choosing” the number of middle-class consumers will increase by three billion people over the next 20 years. Copper consumption in developed countries remains stagnant but the appetite for copper in developing countries is growing at an astonishing pace. The annual per-capita consumption of copper in India is 0.47 kg., China's is 5.4 kg. and the world average is 2.7 kg. North American consumers use about 10kg of copper per capita. As China undergoes massive urbanization, builds its infrastructure and becomes more of a consumption orientated society, more like the west, copper consumption will start to approach North American levels. Because of the huge population differences between East and West just a slight increase in Asian and Indian consumption will translate into enormous demand growth. "From a copper-specific perspective, we believe global copper consumption growth will continue to be underpinned by continued robust growth in completions until at least late 2013. This growth in completions is set to be complemented by a forecast pick up in property sales in 2013; higher property sales are associated with higher consumer appliance related copper demand. Together, these findings represent the backbone of our constructive view on copper over the next 6-12 months. The current wave of construction projects in China originated with the implementation of a stimulus package in 2009. Internal and external copper wiring (connection to grid) tends to be installed around project completion, and can account for as much as 50% of Chinese copper consumption. The construction cycle for the first wave of projects launched in 2009-2010 are now in their late stages, resulting in a sharp fall in new projects and rising building inventories. The copper market is already in deficit as miners struggle with operational and labor problems and LME copper stocks are strongly held. *Energy can be thought of as a proxy for labor, materials, energy and externalities – environmental, community impact etc. 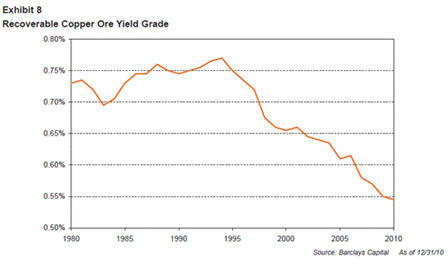 The metal content of copper ore has been falling since the mid 1990s. A miner now has to dig up an extra 50 percent of ore to get the same amount of copper. As grade drops the amount of rock that must be moved and processed per tonne of produced copper rises dramatically – all the while using more energy that costs several times more than it use to. With the lower grades of ores now being mined energy becomes more and more of a factor when considering economics. China has recently, and for the first time ever, revealed the size of its *copper inventories – and they **scared the hell out of investors when they did it. *China's Non-Ferrous Metals Industry Association announced that the country's copper inventories were at about 1.9 million tons at the end of 2010. If you were a buyer – and at 40% of world usage China is THE big buyer – and you needed stock would you want lower or higher prices? Remember, a Chinese copper buying spree in early 2009 triggered a price rally from the lows of the financial crisis to new records above $10,000 a tonne. Do you think China might have an interest in inflating the size of its stockpiles to push prices down? And really, does it matter if they have two million tonnes or three million tonnes today? Tomorrow they need more, a whole lot more, even if future economic growth “only” clocks in at an annual 7.5 percent compounded. Are Copper Shenanigans, and the investment opportunities presented, on your radar screen?